We are now entering the embroidery phase. It's going well, when I remember to take larger stitches over long "straightaways" or gentle curves -- tight curves look better with smaller stitches. The stabilizer wears the wool thread rather quickly; I may need to use shorter pieces, but that will wait until I've used up the stuff I've already cut. * I think it's looking pretty good, though, see? 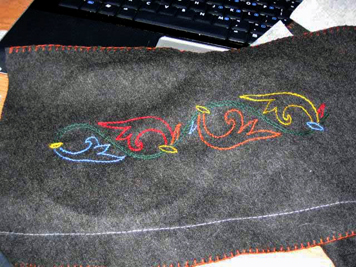 This is two repeats -- as you can see, the green doesn't pop too well. I haven't yet decided what to do about that. This is a close-up of the second repeat. I'm fairly pleased with my progress, though the behavior of the stabilizer and fabric in the hoop is driving me a little nutty. 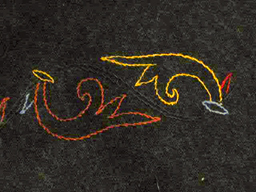 I'm used to having my ground fabric drumhead-tight when I embroider, and I can't here, and it's a little irritating. (I can be a little obsessive about these things...) No really big deal, though; I'll get over it. Hopefully I'll be able to embroider some in the truck. If not the cloak project, then maybe I'll work on some Queen's favors. And if that doesn't work out, I have podcasts and music to listen to. And there's always sleeping, which is what I do best in a moving vehicle. *I have discovered that the quickest way for me to cut many threads to approximately the same length is to set my swift to the desired length with a tape measure, then wind the thread on. When I get to the end, I cut through all the threads at the same location as the beginning of the skein. Quick and easy -- they're not perfectly the same length, but close enough. And i'm going to spend the entire duration of this project reminding him of that. the swift thing is brilliant. I am totally going to have to remember that. I thought about using a niddy noddy, but one of them is too small, and the other is too big. The swift worked really well, though; I was most pleased. Lovely work! I need to finish off phase 1 of my silk-on-silk embroidery, which I haven't touched since returning from Baltimore Mem'l Day wkd.